Last week, just before the stock market tumbled on the heels of sharply higher rates, we noted that one of the key culprits behind and indiscriminate selloff, systematic CTA funds, were not yet present. Specifically, as Nomura's Charlie McElligott said the bank's latest CTA model showed that systematic-trend funds were "at- or near- deleveraging "triggers" however not quite there yet. 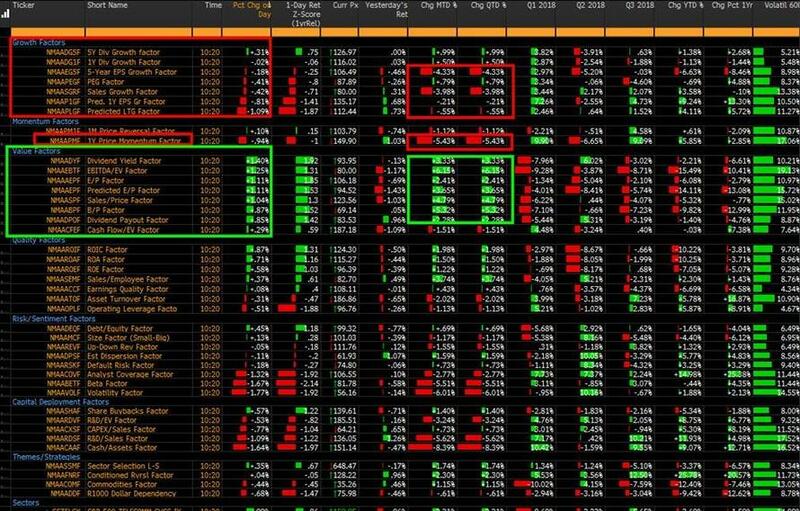 According to the latest update from Nomura's cross-asset quant, CTA deleveraging (as 2w and 1m window short-term models flip “short”) has finally kicked in, creating -$66B of SPX for sale as “Long” position goes from +97% to +77% and then ultimately to +57% on the break below below 2895 (assuming futures levels “hold lower” at the close), a threat then can “self-fulfill” with front-run flows. Meanwhile, the ongoing rates selloff and continued “bear-steepening” trend has continues to fuel the “into Value, out of Growth” trade which is the opposite of five-year legacy positioning. 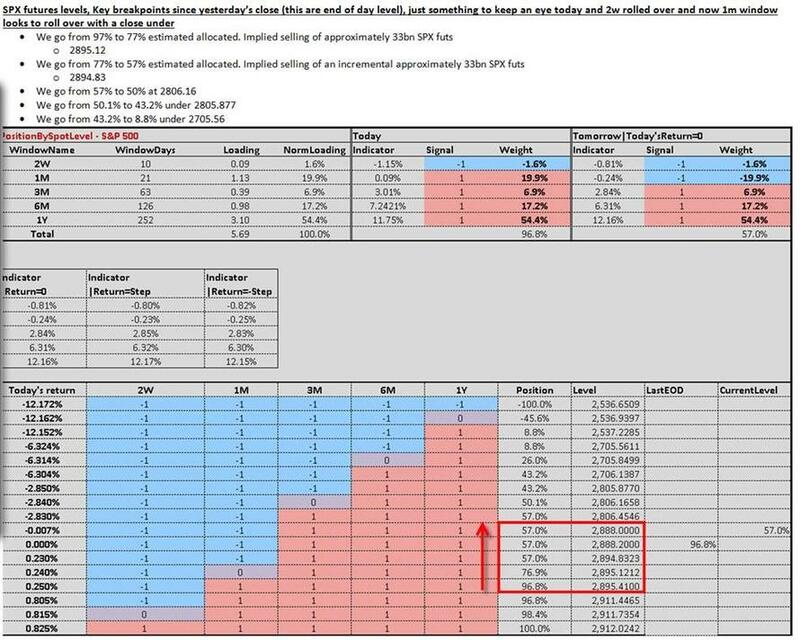 According to McElligott, this "Growth/Value" reversal is “pure unwind” in Equities Momentum, as US 1Y Price Momentum now -5.7% MTD, and in EU, 1Y Price Momentum -3.1% MTD as well, with -1.5% (a -3.5 z-score move) today alone. This can be seen quite clearly in the recent performance of the momentum MTUM ETF, which has plunged in the past week, with the drop now approaching the magnitude observed after the February VIX meltup. 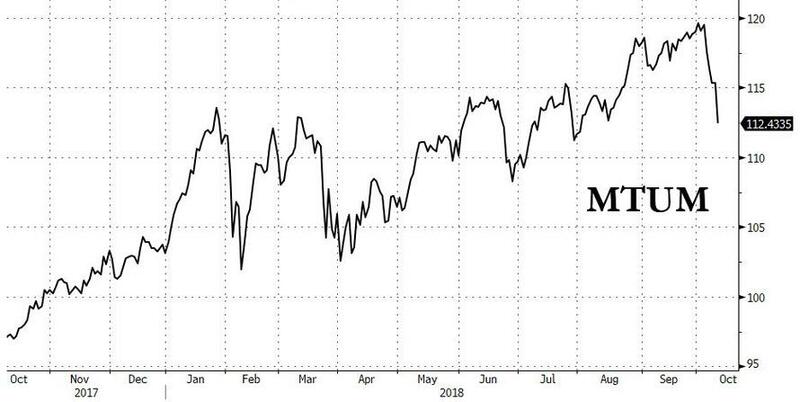 Meanwhile, the ongoing destruction of VIX “roll-down” strategies which went “Max Short” vega last week prior to multiple days of curve inversions, are now covering into “Max Long” Vega. The good news is that unlike in February, there is no major gamma overhang from ETF vol sellers, as that would recreate the panic, and market rout, that took place on February 5.